Great weekend spot to just lay out with a picnic blanket, picnic foods & drink (you can have open containers) with good company. 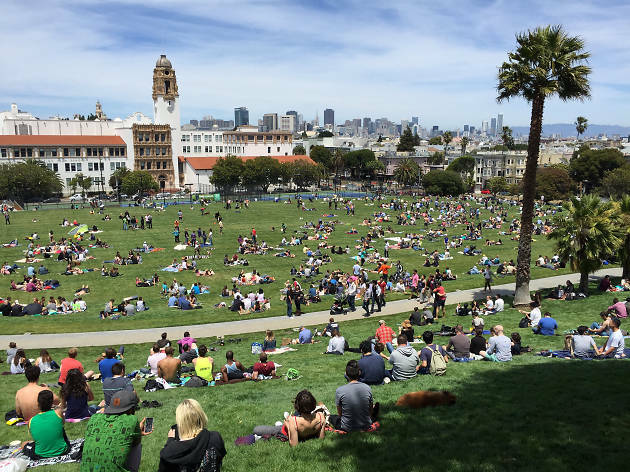 Dolores Park has very much a beachy vibe – people spread out, laying in the sun as if it was the beach. The park is pretty hilly and vast, you can lounge around or bring a ball (tennis, basketball, etc) and toss that around. There’s vendors that go by (ice cream carts, etc) and people recycling your bottles, but all in all contributes to a great scene appreciated by the locals. It’s got great views of the city as well. 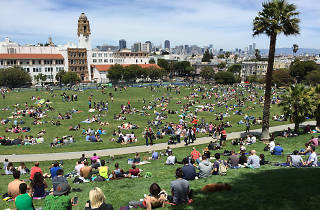 I’m not a local to SF, but I’ve heard from many of my Bay Area friends that Dolores Park is near & dear to their hearts & within close proximity to the Mission, it’s a great place to take friends that aren’t residents of the bay.